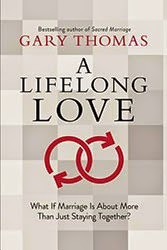 I received A Lifelong Love by Gary Thomas complimentary from Flyby Promotions in exchange for an honest review. The opinions expressed are 100% my own. I've always loved reading books on marriage (I think I read way more of them before I was actually married, lol). I like reading these books because there is so much wisdom we can gain from listening to other couples, especially couples who have a Christ-centered marriage. I was excited to get to read this book because I'd heard good things about Gary Thomas' book Sacred Marriage (thought I haven't read it myself) and I've been looking for ways to make God the focus of our marriage. I have to say I really enjoyed A Lifelong Love. It's a book for any couple, no matter the season of life you may be in. The book is divided into three main parts (The Magnificent Obsession, Growing Together, & The Journey Toward Love) with each chapter ending with discussion/reflection questions and a prayer. The text isn't hard to read, but I moved pretty slowly through the book because each section really gives you a lot to think about and process. My favorite part of the book (and very different from other marriage books I have read) is that it is bursting with scripture. The Bible is our handbook to guide us through life, so why wouldn't we use it to discover how to have a successful marriage? I've discovered new ways of applying scripture to my marriage through this book. I also love that there are plenty of real life examples and practical tools given. I would definitely recommend this book to any couple looking to strengthen their marriage by making God the focal point. CONNIE SOWARDS commenting: I entered the Purex Crystals giveaway! I entered the Purex Crystals Aromatherapy Giveaway. I also entered the Purex Crystals Aromatherapy giveaway. Thanks so much for the chances to win great stuff. I entered the "Their Name is Today" giveaway. I entered the "Purex Crystals Aromatherapy giveaway". I entered the purex crystals giveaway. I also entered your Purex giveaway. I also entered the Purex Aromatherapy giveaway, thank you! I entered the Purex Aromatherapy Crystals giveaway. kristiedonelson(at)gmail(dot)com Thank you. I entered the Purex giveaway.